Our funding helps to advance the welfare of working greyhounds and lurchers in Scotland. The Scottish Greyhound Sanctuary rescues dogs from abusive situations, provides veterinary care, neutering and microchipping, and finds suitable homes for the dogs to live out the remainder of their life. Dottie came into the Scottish Greyhound Sanctuary’s care recently aged 5 years after they were contacted by her owner saying he no longer wanted her. When she arrived at the Sanctaury it turned out that she had been bitten by another dog in the same household and had a bad neck wound along with an open ulcer on her leg. The neck injury had just been made very much worse by the fact that the owner had tried suturing it together themselves. ​Dottie couldn’t go into a foster home that day, as she had to go straight to the vet for emergency treatment. The treatment involved the infected and dead skin tissue being removed, and the wound re-sutured. The wound ended up being bigger than the original injury because of the dead tissue that had to be removed. Dottie had to be kept in overnight to monitor her after the surgery. Dottie went to her foster home the next day and hasn’t looked back. She continued to make excellent progress and went from being shy, worried, stressed and nervous to a dog who enjoys cuddles and petting.Sudden movements no longer worry her. 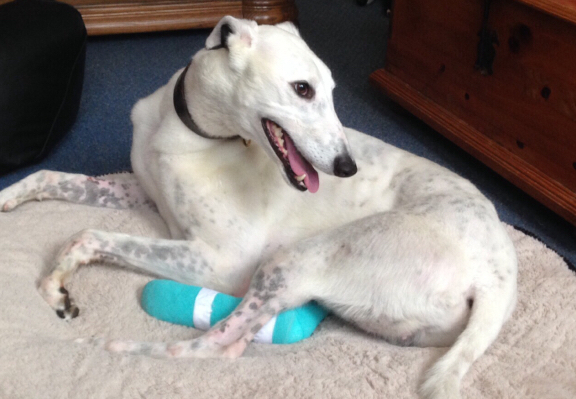 Thanks to the Scottish Greyhound Sanctuary, Dottie has learned that every hand that comes towards her isn’t going to hurt her. She is now rehomed and living a happy life as she deserves.